The Super Service Award is completely free and is the highest honor given annually to the top 5% of qualifying businesses on Angie's List. Home Revision Is Your Source For Full Service Remodel & General Contracting Of The Home. Our goal is to help the homeowner with a smart solution for getting the most for their money while increasing the value of the home. We offer Kitchen Remodel, Bathroom Remodel, Interior Design, Lighting, Countertop Install, Flooring, Popcorn Ceiling Removal and Finishing. The kitchen is the heart of the home. It is the one room your family uses together more than any other in the home. More than just a place to prepare food, the kitchen is most often the gathering place of choice for family and friends. In our busy lives a kitchen that is functional, beautiful and comfortable has become a necessity. What will it take to transform your current kitchen into a haven? Considerable amount of time and interaction occurs in this most important area of home. So many things need to be considered to make this investment worth every penny spent. The second best place to invest money in your home is the bathrooms. Most important is the master bathroom. Your day begins and ends in this room. When you can start your day in a relaxing beautiful atmosphere, your are more likely to have a more peaceful mind. Then when you are ready to retire the day, ending on that same note is priceless. 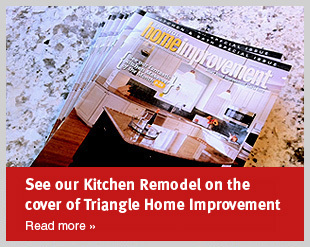 Home Revision is a licensed General Contractor, locally owned and operated serving: Raleigh, Cary, Apex, Wake Forest, Garner, Clayton, Selma and Smithfield, NC.